We are Thelma and Louise. We had quite a trip of our own to tell you about but it ended up with a better outcome than our movie charter namesakes. We were surrendered to a shelter in Susanville by the family when the original owner could no longer care for us. 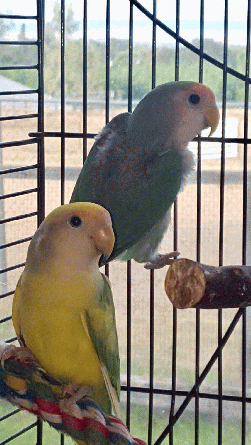 They contacted Mickaboo and a bird train was set in motion to bring us as far as the Sacramento area where the lovebird coorinator met up with the transporter and brought us to our foster home. Because there were so many off us we were observed so see who was bonded to whom and we were put into smaller groups of 4 to give us more space so we were not cramped into one cage. After one of our cagemates showed agression we were further split up and the two us stayed together which we like just fine. We get along very well and will be low maintainance as we keep each other company. We are not used to be but if you continue to work one one with us who knows, with patience and time maybe we might learn this "step up" thing we keep hearing about. As mentioned though we are quite happy to just hang out on a playgym or on a playtop on our cage and chat with you. Update 11/2/17 - Well, we have had a name change which is fine we think the names are super cute! We have been told we are absolutely adorable and a lot of fun to watch and have around. So me, Princess Peach I tend to lay an egg on occasion and Lulu Lemon is much more mellow. We do not like to be touched or picked up but our foster mom thinks that if someone had the time and was willing to work with us we could tame down into more handle-able birds. We don`t mind being talked to or having our cage cleaned so there is hope! We are very bonded, very healthy and great eaters! If you think we are the lovies for you please let the lovebird coordinator know.